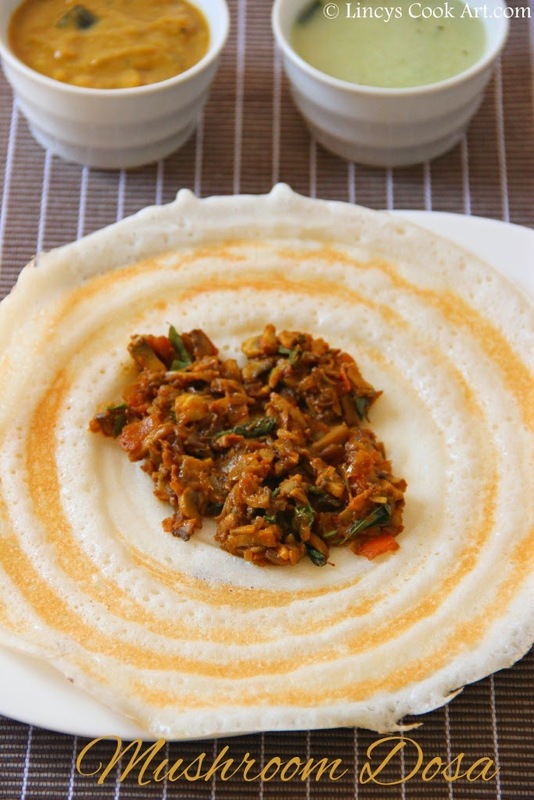 This a simple to make spicy dosa, filled with mushroom masala. Healthy tasty and low calorie filling and also tastes alike non veg preparations. Does not require any side dish for a dip but if you want you can serve with sambar or chutney. I used to make chapathi rolls also using this filling. Dosa or chapthis filled with mushroom masala tastes great. Generally masala dosa is prepared with the potato filling. Which adds more carbohydrate in your diet. And also have to precook the potatoes and the masala preparation takes time. But mushroom cooks in no time; this recipe saves your time and is also a healthy alternative. So i have replaced potatoes filling with this spicy mushroom filling. Heat oil in a pan and add onion and saute till it becomes translucent in about a minute. Add green chillies, ginger and garlic, curry leaves and saute till the raw smell of the ginger /garlic leaves. Add tomato and cook in medium high flame to allow the water oozes from the tomatoes and evaporates. Add the turmeric powder, chilli powder, coriander powder, garam masala mix well and cook for thirty seconds on low flame. Add the mushroom and salt; keep the flame on high to dry out till moisture oozes out from the mushroom. When the water almost evaporates add the coriander leaves and stir well; switch off the gas. Heat dosa pan and grease with few dops of oil ; add a big laddle full of dosa batter. Spread the batter as a paper thin dosa and add few drops of oil on top of the dosa. Keep the mushroom masala on top of the dosa at the centre and allow to cook the dosa till golden colour. Fold the dosa and serve hot. Masala Dosa.. Looks absolute delicious . delicious masala dosa. Love them..
yummy and crispy masala dosa. Looks crunchy dosa with delicious filling! Yummy masala dosa! Everybody's favorite! Omg, am drooling here..I want to invite myself to ur place to have crispy,delicious dosa. Yummy twist to the masala dosa. Dosa looks very crispy and Mouthwatering too.